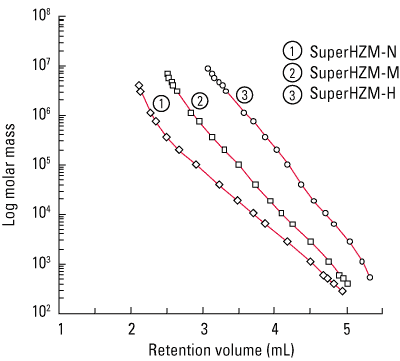 The TSKgel SuperHZ column line consists of five columns with different pore sizes, TSKgel SuperHZ1000 through TSKgel SuperHZ4000, and three columns with an extended linear range of the calibration curve, TSKgel SuperHZM-N, SuperHZM-M and SuperHZM-H. The calibration curves are shown below. TSKgel SuperHZ columns have been developed for high throughput, high efficiency GPC applications such as those encountered in combinatorial chemistry experiments. These columns are based on the TSKgel HXL column line, differing only in dimensions (4.6 and 6.0 mm ID x 15 cm) and particle size. 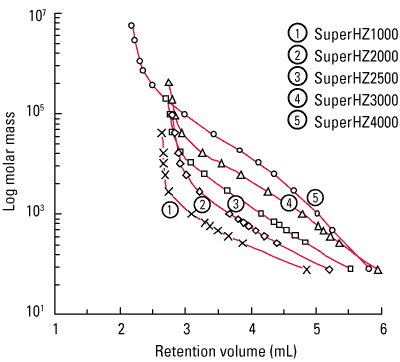 The benefits of TSKgel SuperHZ columns over conventional TSKgel HXL columns are shown in the following chromatogram. Maximum operating temperatures for TSKgel SuperHZ-type columns are 60 °C for TSKgel SuperHZ1000, SuperHZ2000, SuperHZ2500 and SuperHZ3000, and 80 °C for the remaining columns in the product line. Limited solvent range. The columns are shipped in THF, which can be exchanged for a limited number of organic solvents as shown below. Column dimensions are 6 mm ID x 15 cm and 4.6 mm ID x 15 cm versus 7.8 mm ID x 30 cm for conventional GPC columns. The smaller column dimensions translate to a reduction of peak volume by a factor of 3.4 (6 mm ID) and a factor of 5.8 (4.6 mm ID) versus the same component eluting from a corresponding TSKgel HXL column. Thus, your HPLC system may require optimization of components that can give rise to extra-column band broadening, such as connecting tubing, injector, injection volume, detector cell volume, and detector time constant. The TSKgel SuperHZ product line contains three mixed bed columns, in which particles with different pore sizes are blended to provide an extended linear calibration curve. The mixed bed columns feature increasing linear calibration ranges, from TSKgel SuperHZM-L, SuperHZM-N, to SuperHZM-H.
Solvent compatibility for TSKgel SuperHZ columns The column shipping solvent limits the types of solvents that can be used with each column type. Keep flow rate below < 0.5mL/min during solvent change. Solvent can be changed one way/one time only. All TSKgel SuperHZ analytical columns are shipped containing tetrahydrofuran (THF). Prolonged exposure to carbon tetrachloride can corrode the stainless steel parts of a column and an HPLC system. * 100% methanol cannot be used with TSKgel H-type columns; use this solvent with TSKgel SW-type or Alpha columns. ** TSKgel H columns may be specially ordered with this shipping solvent.